The first batch of Vegas mailers of the year arrived today. I don’t think there’s anything that would have been influenced by our play at Christmas yet, but still a few decent offers. It’s already enough to not have to pay for five of the nine nights on our trip in March! T-64, by the way. I got a two night free stay at Terrible’s which includes $50 of slot play just for showing up – pretty good. I’ve heard that Terrible’s have downgraded the 9/6 jacks-or-better video poker machines that were a positive expectation game when combined with food comps and gas card promotions. If this is true then we’ll probably just take their hospitality and money and not worry too much if they kick me off the mailing list for not giving them any action. Claire got two separate room offers from Four Queens. One is specifically for Superbowl weekend and even though we can’t use I’m quite excited that any casino would consider us valuable enough for a free room on one of the busiest weekends of the year! Of course, they’re not allowed to mention the NFL’s championship game by name, it’s simply an invitation to "the most spectacular game of the year". We can actually use the other offer on our next trip. To very tenuously commemorate the Chinese New Year, we can take 3 nights free any time in February or March and add additional nights at a bargain rate if we can’t get enough freebies anywhere else. 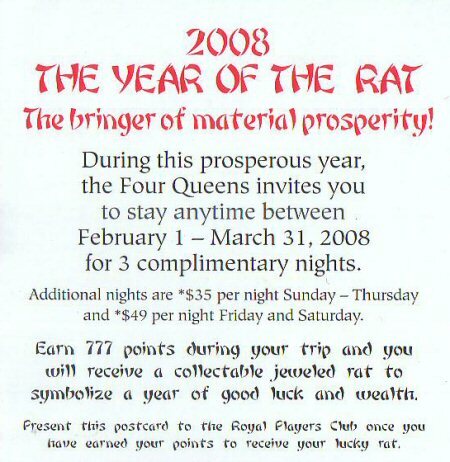 Not only that, but as it’s the Year of the Rat, there’s another very special players club offer that’s going to be very hard to resist. Earn 777 slot points ($6216 coin in) and get a free "collectable jeweled rat". I do hope it’s in addition to the $19 cashback those points will earn, not instead, but however it works I’m sure curiosity will get the better of me on this one. Who wouldn’t want a lucky rat? And with jewels too!